Jordan Temple scored 40 for Bourne against Spalding. Bourne made it five Lincs Premier Division wins in a row with a five-wicket success over local rivals Spalding at the Abbey Lawns yesterday (June 11). It wasn’t all plain sailing for the team now in third as they stumbled from 66-1 to 114-5 before Quewin O’Connor (35no) and Rob Bentley (22no) combined to steer them past Spalding’s 155 all out. Sam Evison (41) and Jordan Temple (40) had earlier batted well for Bourne. Chris Dring (48) top scored for a Spalding side undone by the seam bowling of Matthew Kidd (4-16) and Colin Cheer (3-60). It was a first defeat in three for Spalding who nonetheless are safely situated in mid-table. Market Deeping also suffered a first loss in three matches as they became the latest team to suffer at the hands of powerful leaders Bracebridge Heath. Bracebridge won the game by 244 runs after amassing 375-7 in their 50 overs. 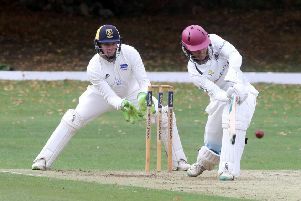 Openers Matthew Lineker (119) and David Whapplington (89) put on 206 for the first wicket, while Deeping opening bowler Ashley Fisher conceded 100 runs in his 14 overs. Deeping were dismissed for just 131 in reply with lower order man Ali Sharp top scoring with 29 (four sixes) from just 23 balls. Deeping slip to within two points of the relegation zone, but skipper Dave Sargent was far from downhearted. Spalding 155 (C. Dring 48, J. Manton 25, W. Nel 22, M. Kidd 4-16, C. Cheer 3-60, J. Berry 2-36). Bourne 159-5 (S. Evison 41, J. Temple 40, Q. O’Connor 35no, R. Bentley 22no, D. Millgate 3-65, J. Miles 2-27). Bracebridge Heath 375-7 (M. Lineker 119, D. Wapplington 89, Z. Simmonds 3-87, A. Fisher 2-100). Market Deeping 131 (A. Sharp 29, A. Fisher 24no, D. Gillett 21, A. Willerton 6-42, M. Carter 3-22).